Personal Security: Keeping Yourself and Your Family Safe is a video presentation. Length: 26 minutes. In Personal Security: Keeping Yourself and Your Family Safe, presenter Rosalind W. Jackson provides personal security guidelines for securing your workplace, home, and automobile. This presentation addresses topics such as assault prevention and deterrence, physical resistance, and personal safety techniques. It also covers issues such as theft and harassment, and provides safety tips for automated teller machines (ATMs), hotels, elevators, automobiles, and at home with children. It touches on safety issues unique to children, as well as sexual assault, domestic violence, and what to do following an attack. This presentation is an excellent resource for security professionals and non-security professionals alike. 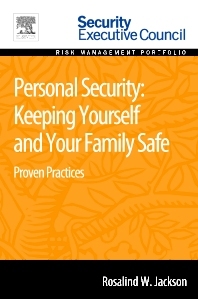 Personal Security: Keeping Yourself and Your Family Safe is a part of Elsevier’s Security Executive Council Risk Management Portfolio, a collection of real world solutions and "how-to" guidelines that equip executives, practitioners, and educators with proven information for successful security and risk management programs. Security professionals and non-security employees with security responsibilities; educators who need instructional resources for their use in corporate training programs or in the classroom; and anyone interested in learning ways to protect his or her person (or family) in the workplace or at the home. Rosalind “Roz” Jackson is a career professional, having been employed by a Fortune 100 company as manager of the workplace violence prevention program. There she consulted with and advised managers and human resource professionals in the management of potential workplace violence interventions. She was responsible for developing programs to address potential workplace violence issues and led workplace violence prevention programs including training of managers and supervisors in the corporate office and manufacturing settings. After Georgia-Pacific’s acquisition by Koch Industries, Roz continued to monitor workplace violence issues in conjunction with her duties as manager, compliance and ethics. Roz has completed in-depth training in workplace violence prevention and intervention from nationally known resources and was a charter officer of the Atlanta/Southeast Chapter of the Association of Threat Assessment Professionals. She is actively involved with a local domestic violence advocacy organization.